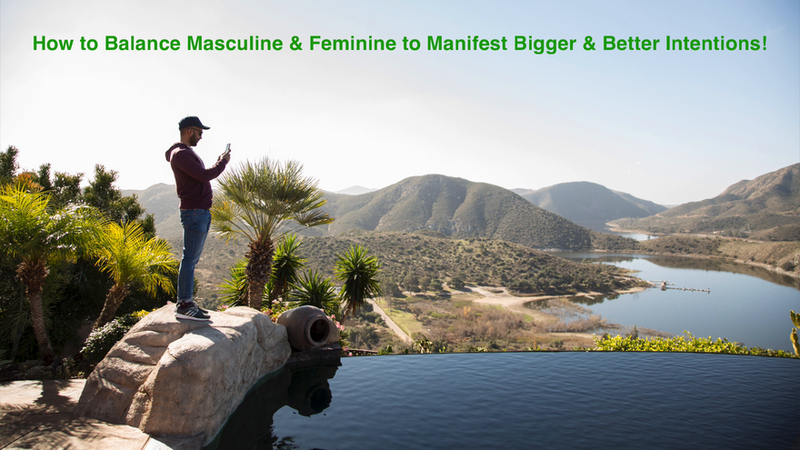 Balancing your masculine and feminine energies will support you in accessing strong manifestation power because both are necessary to become a next level, master manifester. How do masculine and feminine energies influence manifestation? Masculine energy supports you in going out into the world to claim your intentions with purpose, ambition, drive, energy and motivation. It’s the practical steps necessary to claim what we want to manifest. Feminine Energy is the energy that inspires your intentions. It’s the container to receive your intentions and the intuition that guides you into synchronistic situations where you are at the right place, at the right time, doing the right thing to receive your intention. To get a good idea of if your masculine and feminine energies are balanced (yin/yang), you can look at your relationships with other human beings. Your relationships are mirrors into the inner work that wants to happen for you to fully actualize your power as a master manifester. Here are some things to look for in your relationships to increase your power as a manifester. If your core essence is masculine, notice your relationship with others whose core essence is feminine. Do you feel powerful in their presence or do you shrink? Also, when you feel powerful, is there enough space for the feminine to be in their power at the same time? Is there a synergy of energy rather than one stepping on the other? If your core essence is feminine, do you feel powerful in the presence of masculine energy? Do you shrink when in the presence of masculine energy, castrate that energy, or invite it to stand fully in its power as you do the same? Are you willing to receive in the presence of masculine energy? I allow myself to stand in the fullness of my power in my relationships. I invite and require those willing and ready to be in healthy relationship with me to stand in the fullness of their power as well. Together, we create an experience of fully actualized, harmonized and balanced expression of the powerful beings of light that we are. PS: Leave a comment below and let me know if you feel like you're balanced in masculine and feminine or not.